Five members of the hiking club flew from Indianapolis to Munich. We then took a two trains and a bus from the Munich Airport to near our hotel in Reit im Winkl. We used a Bavarian Ticket that cost us 30 Euros for the group (approximately $45). We were met at the bus stop by Helmut and Karola Hackenberg (friends but not relatives of Olga and Bob Hackenberg). Helmut drover our luggage two blocks to the hotel and we walked there. We had rooms at the Hotel Guesthouse Am Hauchen for the week and hiked each day from the hotel to our hike destination and back. Most of our hikes were 10-12 miles and took from 9 in the morning to 5 in the afternoon. On the all-day hikes we would have lunch at the hike destination. 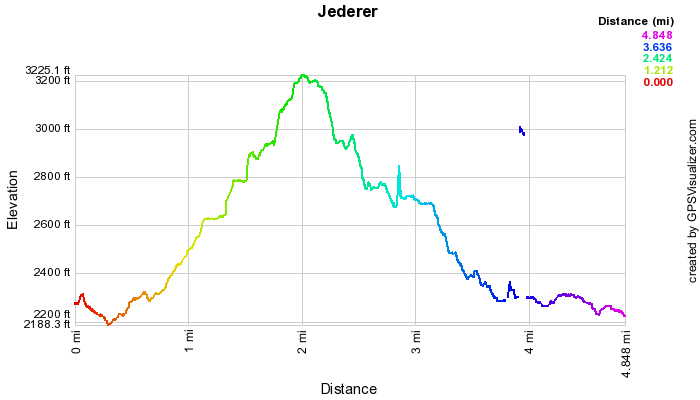 Each of the hikes were tracked by a GPS receiver. These GPX track files were used to plot the hikes on a Google map and to generate a elevation plot. For each of the hikes below there is link to the track map, the elevation plot, and to the track file itself. Those who visit Reit im Winkl in the future can download the GPX files to their GPS and they can follow the routes we took. You can load these files to gpsvisualizer.com to see them on a Google map. This was very good hike through some fairly rough ground. We had to find an entrance to the trail along the highway about a mile from the hotel. Once we found the trail, we were always a little bit unsure whether we were following the right trail because at certain forks we had to decide where the trail marker was actually pointing. After about 4 miles along the trail, we had to decide whether the marker was poing to a gravel trail that led through a substantial gate or along a cow path. We took what was the most obvious choice but this kept leading up and up until the gravel ran out. The path we picked up started taking us along a very steep hillside. This trail ran out and we decide to slide down to one we saw down lower. At that point two young men were coming up the hillside we were going down. They said that we were never going to make it that way and offered to lead us back to the right trail (which was the cow path). Needless to say, everyone was pretty muddy. The rest of the hike was uneventful. At Seegattrl we met Helmut and Karola for lunch and then hiked the rest of the way home. 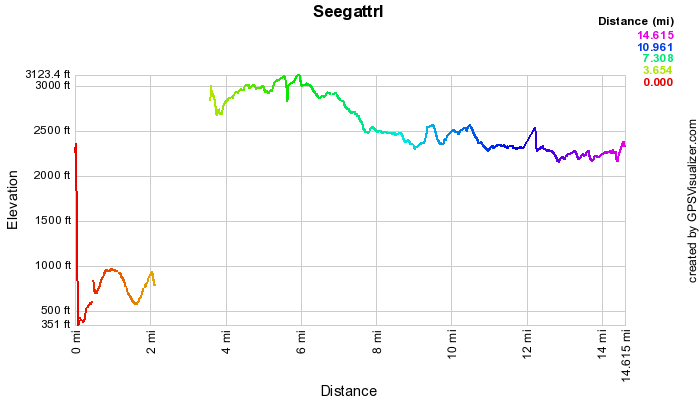 The GPS receiver had a hard time registering at the beginning of the hike for the first two miles. 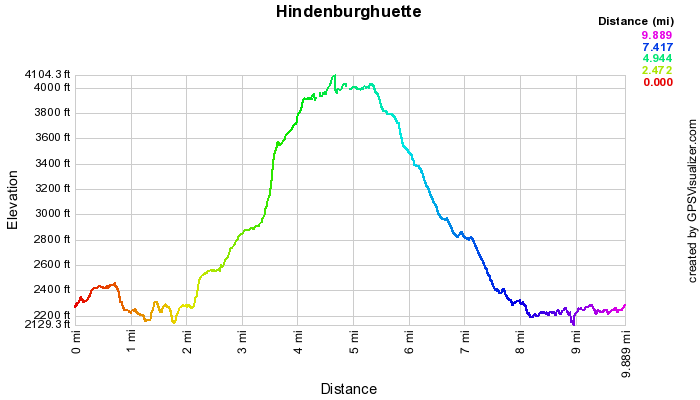 As a result, the hike map and elevation plot are somewhat incomplete. Recommendation: This hike is definitely worth it. If you attempt it, I would recommend using the GPS track file as a guide to which trails to follow. The distance without the detour is about 12 miles. The plan was to hike from Reit im Winkl to Koessen, Austria, via a higher trail that went by the Peternhof Resort. We met Helmut and Karola at the arts and crafts fair in Koessen. 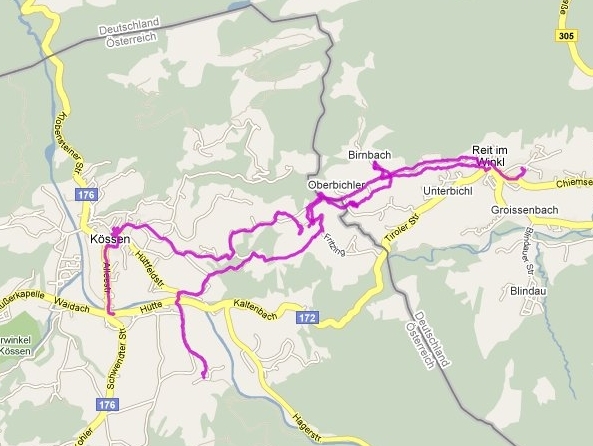 Helmut suggested that he drive us from Koessen to a ski area two miles away (he had to do it in two trips). At the ski lift area we boarded a gondola and went to the top where many paragliders were launching. We had been watching them from across the valley. We had lunch there at the lodge and then took the gondola back down to the bottom. We then hiked from there back to Reit im Winkl taking a slightly different trail back. Recommendation With the visit to the fair and then to the ski area, this made for a very long day. 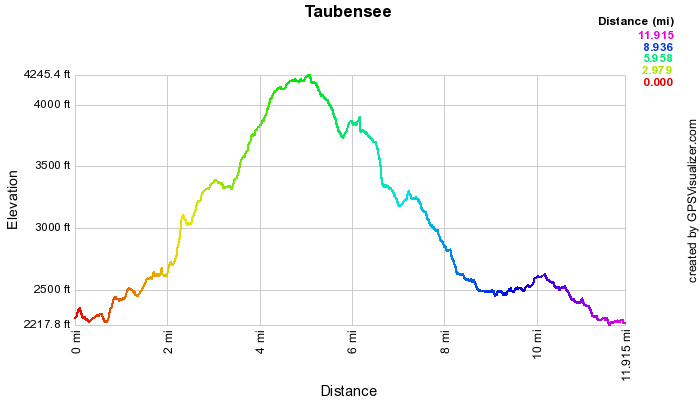 The next time it might be better to hike to Koessen, see the town, and then go on by foot to the ski area. That will be about 8 miles. Take the gondola to the top (don't forget the discount coupon from the hotel), and watch the paragliders. Then after coming down, take a local bus back to Reit im Winkl. Ask at the hotel or tourist office about the schedule of the buses. This is a strenous hike up through woody switchbacks and then back down a paved shuttle bus road. There are never any really good views. It seems to be in a park area that has excluded any homes or farms. There is a walking loop at the top which we didn't bother to take because overall lenght of the hike that we were doing. There is a shuttle bus that you can take to the top. Recommendations: The hiking was strenous and not very interesting. This might be good trip for non-hikers who wish to take the shuttle to the top and walk around. There is a restaurant at the top and you can have lunch there. There are better hikes available. This was a strenuous but very enjoyable hike. The trails were all marked well and the second hut that we stopped at for lunch was a nice break and the food was good. Taubensee is a lake high up in the hills. It is mainly on the Austrian side of the border. There were actually bathers in the lake when we were there. The trail is never realy steep but it just seems like it keeps going up. This seems to be a popular hike in the area because we saw a lot of people on the trail. Early on we met a lone hiker by the name of Dorothy. She seemed to know where she was going so we stayed with her. Recommendations: This is a must-do hike. It would be difficult to make it any shorter than 12 miles and does represent a 2000 foot climb. Plan on eating lunch at the second hut and enjoy yourself. The second hut is about a quarter-mile past the lake. 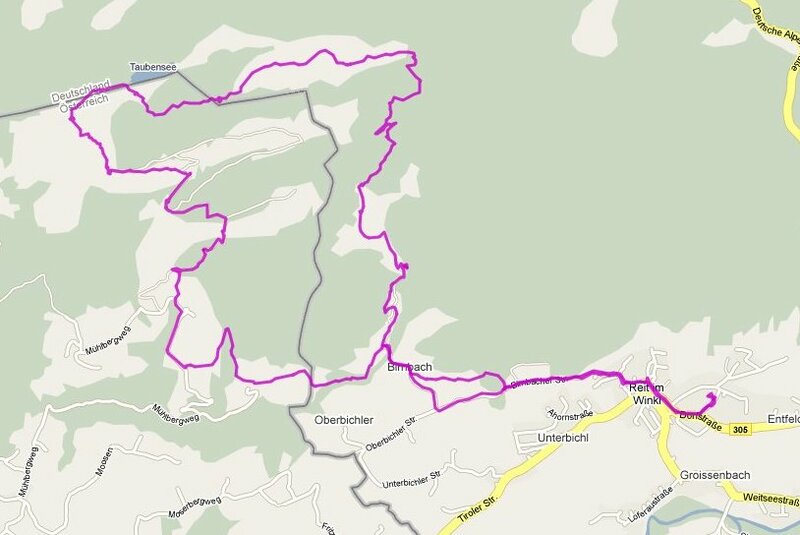 This is a hike that leads up behind the hotel to the Eckkapelle (means 'corner chapel') and to the Jederer Guesthouse. It's only five miles long but you climb 1000 feet along mostly gravel and dirt paths. On the way up you pass Stations of the Cross until you reach the chapel. It's an open-air chapel that you can peak into. After you go higher, there is an overlook that looks down the other side of hill. On the way down you hike to Jederer guesthouse. There is nice array of covered tables on the deck that have a great view of valley down below. Recommendations: This a relatively short hike but it would be a challenge for non-hikers because of the 1000 foot elevation you have to deal with. It's not necessary to go all the way to the top to get to the guesthouse and restaurant. Cars can actually drive there. You might want to take a late morning hike to the top and then meet others at the restaurant for lunch.